Cellular shades from Payless Decor offers tremendous insulation properties, look spectacular, and provide superior light control as well. These shades are otherwise known as honeycomb shades. The cell structure of the fabric provides insulation between the window and the rest of the room when the shade is down. This can help reduce heating and cooling bills even as it keeps your room more comfortable. These shades come in a wide variety of colors ensuring that you can use them with any color or décor scheme that the room has. 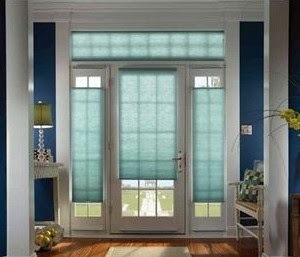 Cellular shades can be used in kitchens, dens, offices, living rooms, dining rooms, breakfast nooks, and bedrooms. They come in a top down and bottom up model as well as only top down model. The combined model ensures that you can open the shades from the bottom or window sill or form the top, offering greater flexibility in light and privacy control. Whether you need to control light to minimize glare on your TV or computer screen, or want to control the amount of light filtering into your kitchen, these shades are the best option for you. The cellular shades offered by Payless Décor can either be controlled using cords or remotes. When you choose a shade that is operated using a cord, you need to be careful about young children endangering themselves with it. On the other hand, a remote controlled shade is ideal for hard to reach windows as well as in homes with small children. When picking cellular shades you also need to decide on the degree of privacy and light control you need. These shades also provide some degree of sound proofing. There are three types of cellular shades, those with a single layer of cells, those with two layers, and those with three. While even a shade with a single layer of cells can provide some degree of insulation, sound proofing, and light control, the three layers of cells are recommended if you require a greater degree of privacy, insulation, and light control. Many people prefer to use the three layers of cells in their shades when covering windows in bedrooms or rooms facing the street. These shades come in many fabrics, ensuring that you have plenty of décor choices for every room in your home. These shades can also be used to cover French windows and other large windows. Payless Décor offers the cellular shades in a variety of sizes to ensure that every window in your home can be properly fitted. The cost of the shades depends on the size of the windows, the layers of cells required, and the type of cord used. One can use cellular shades in both homes and offices to enhance the looks of the room while also improving the energy efficiency. The superior insulation provided by these shades can help keep rooms warm in winter and cool in summer without increasing your energy bills significantly. Additionally, the sound proofing abilities of these shades make them ideal for use in busy, industrial, and many residential neighborhoods.